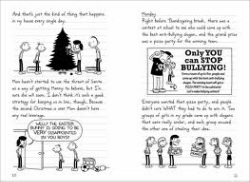 Diary of a Wimpy Kid is a funny book about a kid that gets stuck in the house with his brother (Rodrick), his mum and his little brother (Manny). There dad couldn't come home because of the snow but there dad called and said it was too dangerous for him to drive home, so he was gonna stay overnight near a hotel but when there mum called his dad that the basement was flooded he's dad was sorry he wasn't home to help , but something tell's Greg that he is okey with the way things worked out for him.because a Blizzard has come from the winter season. They were short on food supplies and they have to because there mum was supposed to go grocery shopping the day the blizzard hit. So they have less food than usual to begin with. Then there mum said we're gonna have to start rationing until she can go out. The snow was getting higher about 1 feet higher. There was so much snow that it reached up till there mailbox. There mum said since there is a lot of snow coming the electricity was going to cut out. When there mum was right the electricity was cut out and it didn't come back on. When it was cut off the temperature got lower by -1 degrees. Greg's mum said that we have to keep the fridge door closed so the food won't thaw out and get ruined. They also have to keep the door closed so they won't lose to much heat.